The availability of effective measurement tools is a clear prerequisite for the strengthening of monitoring and evaluation within the field of child protection. 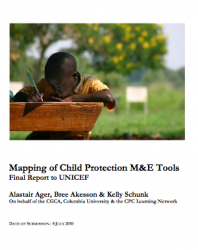 This report provides a structured review of a sample of 124 child protection M&E tools. Tools were selected for review with respect to explicit inclusion criteria regarding relevance to certain focal areas of child protection, structured means of data collection, and documented use in monitoring and evaluation activity. With tools being made available along with this report (or links to access being provided) this compilation also represents a valuable consolidation of material for potential field use.